Are you an SAP® Analysis for Office user who wants some tips for getting around the frustrations you’ve experienced with reporting? Are you considering a move to this application but would be keen to see a cost effective alternative that leverages native Excel and installs easily? Join us on Thursday, 7th June, 2018 at 12:00pm for our Webinar and lean how you can update your Planning and Financial Reporting. Although Analysis for Office is positioned as an ad hoc and multi-dimensional analysis tool that makes it easy to filter and manipulate data in Excel, this is not always the reality. Many finance teams still run into roadblocks that make real-time reporting and analysis difficult. Who is this webinar for? - Anyone who uses Analysis for Office and has experienced the frustrations of reporting and analysis within this tool. In this webinar, we will focus on four key areas that can help you retain and enhance the Excel reporting you already have. 4. Empower users to use reports to their full potential – including modelling, analysis and drilldowns. Are you frustrated with your current JD Edwards reporting tool? Are you tired of waiting for IT to make updates? Have you had enough of waiting for reports to run in batch? If so, join our Product Specialist, John Brooks, for a 30-minute webinar on October 10, to discover why Hubble offers you a better way of reporting against JD Edwards. You'll see live demonstrations, customer examples, common issues JDE customers experience with OVR and why Hubble is your ultimate alternative. Oracle reporting can be cumbersome and inefficient. Closing month-end, performing ad-hoc analysis, reconciling and other reporting tasks are becoming increasingly difficult. Join us for a webinar demonstrating how GL Wand for Oracle E-Business Suite can alleviate your reporting pains! Using Dynamics 365 with Power BI? Frustrated by slow query response times? Struggling to report against transactional data? If so, don’t miss our next webinar: “Turbo Charge your Power BI Dashboards with Atlas”. Do you feel like your group financial data isn't telling a clear story? Are you spending too much time creating dull, static reports and dashboards, and then recreating them each time the data changes? I'd like to introduce you to CXO Software. Specifically for executives and the enterprise organisations they manage, CXO Software has demonstrated significant ROI at organisations including Mercedes-Benz, McDonalds, Sage, G4s, and many others. Join the CXO VP of North American Sales, Dan Phillips, on 28 March for a 15-minute webinar demonstrating how CXO Software enables you to build dynamic, interactive dashboards and reports directly from your EPM data. Bill Jelen - a real-life Excel expert. Bill has over 29 years of spreadsheet experience. Welcome to a new year with insightsoftware! We will continue to revolutionise your financial reporting through inviting you to some exciting webinars showcasing reporting tips & tricks from a variety of solutions that we offer. Kick off 2019 by advancing your Excel skills! Join Bill Jelen a.k.a, MrExcel as he talks about the amazing new features announced for Office 365 editions of Microsoft Excel. Finance and accounting professionals or anyone interested in improving their Microsoft Excel skills are encouraged to attend. A core activity of finance teams is to publish financial data that is accurate, complete and entirely auditable. The type of key reports produced for a range of stakeholders may include, the Income Statement, the Balance Sheet and the Cash flow Statement. Within the profession it’s often acknowledged that compiling these reports is becoming increasingly difficult due to short timeframes, inefficient tools, countless dependencies, downstream bottlenecks and reconciliation differences. This doesn’t have to be the accepted position. Join Excel4apps On Thursday 11th October at 13:00 GMT for a look into how our tools can help you Prepare and Publish Financial Statements with Ease. We’ll be sharing our views on the challenges in this area and what we believe is the best solution for making this painful process smoother, involving fewer discrepancies and overall better able to pass internal and external scrutiny. Register now and join us! This Webinar is for anyone in finance who uses Oracle and is frustrated with the time it takes to handle consolidations. The path to prepare consolidated financial reports is often plagued with complexity. It’s susceptible to error due to added manual intervention. For organizations using native Oracle tools such as Financial Consolidation Hub or Global Consolidation System, these introduce efficiency to establish a set of consolidated balances. However, they do not present a flexible report solution to publish these balances. Often finance professionals resort to manual preparation of subsidiary consolidated financial reports directly in Excel. Manual preparation of financial reports introduces process inefficiency as balance adjustments in the Ledger impact report output and therefore re-invoke the repetitive time consuming steps of data import and report format. If you’d like to discover a few of the ways that you can reduce the time it takes to handle Consolidation, join this webinar! We’ll discuss some of the inherent problems around Consolidation, some of the frustrations that are common to finance teams, and insight into how to reduce these problems and frustrations. Join us Thursday, 13th September at 13:00 GMT. The balance sheet reconciliation is a key element of ‘closing the books’. It has long been an important control to ensure the accuracy of your financial statements, which in turn highlights the financial condition of your organisation. Reconciliations can identify mistakes and misappropriations and help to ensure that internal controls are being adhered to. Stringent review and scrutiny of balance sheet accounts during the period close cycle provides key stakeholders, management and auditors with assurance that internal controls are being applied and are working effectively. In this webinar, we’ll discuss Balance Sheet Reconciliation – the good and the bad. Join us to look at contributing factors to poor balance sheet reconciliations and how Excel4apps can help you to create a robust, efficient and seamless process. - Audit risks due to not identifying potential fraudulent, improper or material transactions quickly. Many of our Oracle customers have found that existing journal tools lack the ability to effectively validate financial data prior to uploading it into the General Ledger. There is also frustration at poor capability with multiple ledger journals, lack of automation and difficulty loading supporting documentation. This and other topics are discussed in our upcoming Webinar, Ways to Accelerate Closing, Adjusting, Correcting & Recurring Journal Entries. ...And learn how these problems can be solved. This webinar is part of our Series: 5 Areas to Accelerate Period End Close. This series will cover one aspect of the Period End close each month, giving you valuable tips on making the process faster and easier. Watch our BrightTALK channel for upcoming webinars in this series. The period-end close cycle is a myriad of steps that include transaction processing, journal entry capture, and financial statement preparation. At its core, the close cycle must achieve proper cut-off of financial activities each month in a timely manner starting with the Subledgers. Close cycle delays at the Subledger level ultimately impact process efficiency upstream for the General Ledger close and preparation of the financial statements. In this webinar, we’ll discuss some of the common frustrations with Subledger Close and how the Excel4apps solutions can solve these problems easily and cost effectively. Please register here to learn some practical ways of making the Subledger Close a simpler process. When it comes to closing your financial month end, finance is usually looking at a tedious and time-intensive process requiring skipped lunches and late nights. Our recent survey of 780+ financial professionals from around the world showed that 33% are taking 5 days to close their books for a single period with another 41% taking more than 5 days. All financial professionals who are looking to shave time off their period-end close should attend this webinar. Are you currently using or considering SAP® Analysis for Microsoft Office as a reporting solution? Although positioned as an ad hoc and multi-dimensional analysis tool that makes it easy to filter and manipulate data in Excel, the offering creates some challenges for Finance. In this webinar, we will focus on four key areas to keep in mind when using or considering SAP® Analysis for Microsoft Office. Empower users to both consume, but also model and enrich reports. Are you an SAP user? Are you feeling robbed of valuable execution time at month end due to laborious, time-intensive processes and complex tools? Do you rely on Excel during this tedious and stressful time, but find it to be too manual and inefficient? If so, you’re not alone! Join Excel4apps for a guided tour into a typical SAP period-end process, its challenges and suggested ways to improve and streamline standard methods. Learn automation techniques and how you can leverage Excel-based tools to cut reporting time in half! -How connecting SAP to Excel directly can drive significant benefit for the business and users. -Shorten period-end close to improve business KPIs and make finance teams happy again! -Avoid continual re-work and duplication - never export to Excel again! -Manage the close process from real-time Excel. Are you feeling robbed of valuable execution time at month end due to laborious, time-intensive processes and complex tools? Do you rely on Excel during this tedious and stressful time, but find it to be too manual and inefficient? If so, you’re not alone! Join Excel4apps for a guided tour into a typical Oracle EBS period-end process, its challenges and suggested ways to improve and streamline standard methods. Learn automation techniques and how you can leverage Excel-based tools to cut reporting time in half! -Manage the entire close process from real-time Excel. If you are a Finance or Accounting Professional wanting to learn more about how you can achieve a faster, smarter and easier period-end process, then don’t miss this webinar! How easy is to keep track of multiple Enterprise Projects within your business? Do you find it easy to get the information you need out of SAP? Or do you frequently rely on data downloads and reformatting to make sense of the data, leading potentially to errors and out-of-date reports? Join us next week for a webinar on how you can easily simplify your SAP Project Reporting with Real-Time Reporting in Excel. •Ability to Drill Down on transactional data, giving you true insights into the figures. Excel4apps uses the SAP authorisation user-IDs and profiles, it’s deployed quickly and with little training needed. It allows businesses to easily keep their finger on the pulse of multiple projects by providing real-time data to all stakeholders when and how they need it. Attend this webinar if you are a Financial Analyst or a Project Manager looking to simplify your project reporting…and your life too! Would you like to learn the best Excel shortcuts of all time? Then, join Mr Excel. He will take you through his top 40 Excel shortcuts you can’t live without! Knowing Excel shortcuts can not only save you time, but it will increase your efficiency at work, making you look like a pro! In this webinar, Bill Jelen - known as MrExcel - will take you through his all time favourite shortcuts. After the webinar, receive a handy one-page summary that you can keep by your desk to remind you of all the great tips and tricks that you could be using. Attend this webinar if you are a Finance or Accounting professional and/or are interested in improving your Microsoft Excel skills to the next level. Part 1 of this two-webinar series looked at the strategic challenges facing organisations using SAP following the launch of SA/Hana. This part 2 focuses instead on the departmental challenges, and what these developments might mean for operational reporting. In many organisation today, the reality of the reporting environment might means that experienced business users spend 80% of their day manipulating data rather than interpreting it. So, while your CFO might quite rightly be looking at S4/Hana and digitalisation, we would encourage businesses to also Fix Today’s Problems Today, as the real-time access to data discussed in this webinar will not only support but accelerate your path to digitalisation. This webinar focuses on some of the challenges facing organisations using SAP today. There's a lot of noise in the marketplace following the launch of S4/Hana. What does it mean for organisations? How may SA/Hana impact IT and Finance and what does it mean for reporting? Perhaps, most importantly, how can businesses address these challenges so that they are able to improve performance today while safeguarding their investment for the future? This presentation looks at how businesses can fix today's problems today, while also planning for tomorrow. Are you frustrated at the mainly standard, readily structured reports available in SAP? Are you still using Excel to do a lot of the ‘heavy lifting’ reporting? Regardless of IT policy, Excel is still the go-to-tool for most users to transform their data into something meaningful. Yet, static spreadsheets inherently create issues around version control, complex cross referencing, master data references and calculation errors, all of which is an Audit Risk. The responsibility for this tends to fall between the Business and IT and can become a necessary evil. Attend this webinar to hear how you can overcome these issues using an Excel add-in from Excel4apps. •Achieve a genuine Single Version of the Truth - discover how you can access live SAP data in real-time from an Excel front-end - your data remains in SAP but you view it from Excel. •Reduce Financial Reporting and Consolidation Time by 70% - learn how Excel4apps helps you accomplish this goal by solving many SAP Process Challenges. •See the Management Reporting capabilities of the award-winning GL Wand in action - be inspired to transform your period-end process. If you’d like to find out more about how you can manage spreadsheet risk while still using Excel for reporting, then don’t miss this webinar. insightsoftware is on a mission to help companies turn their financial & operational data into better business outcomes that drive growth and ROI. Through their innovative, turn-key reporting and performance management solutions, insightsoftware provides users with real-time access to data-driven insights in an efficient, cost-effective and secure manner. 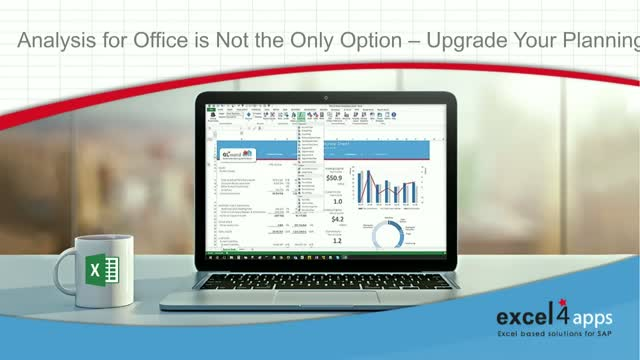 Featuring integration support for over 130 tier 1 and tier 2 ERP systems, as well as full integration into Microsoft Excel, the company has the experience and flexibility to help business leaders unlock the power of their business data so they can understand, manage and optimize their business with ease. More information about insightsoftware can be found at www.insightsoftware.com.